Music To Get You Through Halloween Week! With the spooky season well and truly upon us, our very own music monsters have created this weeks special Halloween inspired playlist! Whether your week is filled with fancy dress parties, scaring trick or treaters, or just hiding away and filling your face with sweets – we have produced an suitably eclectic mix of tracks that would get even the undead (or students arriving for 9am lectures) moving! Ghostpoet – Sorry My Love, It’s You Not Me. Kicking off the week with one of our very own! UK MC and artist Ghostpoet, whose real name is Obaro Ejimiwe, is in fact a CU graduate, having studied media production a number of years ago! He may not be considered overly ‘mainstream’, but has been astounding crowds and critics alike since his debut EP dropped in 2010. This track is taken from his THIRD studio album, Shedding Skin, which was released in March of this year. A massive congratulations is also in order as the album has just been shortlisted for this years Mercury Music Prize – and is his 2nd nomination for the prize in just 5 years! Scarily impressive! Admittedly, it may not be a particularly well-known song choice for many of you, as this classic grunge rock hit from Irish band, The Cranberries was first released in 1994! The song does in fact reflect a serious message, as it is based on events surrounding the IRA conflicts, and the Irish battle for freedom. Although the song didn’t immediately gain UK chart success, it became a big hit around Europe, and even scooped the award for ‘Best Song’ at the MTV Europe Music Awards in 1995. So, a very powerful song indeed, and it has a ridiculously catchy guitar riff to go with it! Fall Out Boy – Uma Thurman. Gold star to those of you that have worked out the Halloween connection in this F.O.B track from earlier this year! Well, fact fans, this song samples the theme tune from a classic 60’s (yes, 60’s – we are having a history lesson this week aren’t we!) 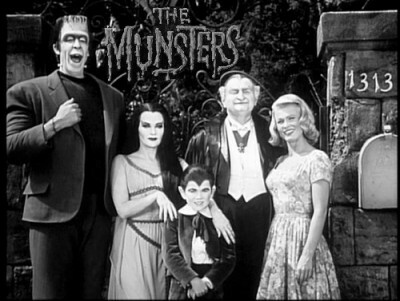 American sitcom, ‘The Munsters’, as seen below. Fall Out Boy have become something of an expert when it comes to catchy pop-rock anthems, and this tune is no exception. The video for this is really good fun too, and watch out for a poignant political reference at the end. We feel that this song would make a couple of excellent pub quiz questions! DJ Jazzy Jeff & The Fresh Prince – Nightmare On My Street. It’s good to take a moment and reminisce back to when Will Smith went through his extended pop-rap phase with his old pal Jazzy Jeff! We all know the smash hits ‘Summertime’, ‘Gettin’ Jiggy With It’, and of course, the Fresh Prince theme song – but “this is a story all about how” their track of terror almost disappeared into the moonlight! The song was originally intended to be part of the soundtrack to the horror movie sequel “A Nightmare On Elm Street 4″, until New Line Cinema became concerned about copyright infringement, and a long court case ensued! Although the duo still released the single, the official video was destroyed, leaving it dormant until the power of the Internet was used to share alternative fan videos instead! MWUHAHAHAHA! Skrillex – Scary Monsters and Nice Sprites. How about some dark and dirty dubstep to kick off your wicked weekend? Released from his EP of the same name, Mr Sonny John Moore (Skrillex to you and me, and probably “go on Son” to his friends) sure knows how to get the speakers boo-ming! This track even managed to bag Skrillex a Grammy award for Best Dance Recording in 2012 – which he then won again the following year for Bangarang! Turn this up loud to get ready for your night out, or even louder to scare away unwanted trick or treaters! Bobby ‘Boris’ Pickett – Monster Mash! After all the excitement, activity and inevitable sugar rushes, use this Sunday as the perfect opportunity to wind down and relax after a hectic Halloween. A bit of a hidden gem here from Paramore, taken from their 2009 album Brand New Eyes. The band are most commonly known for their high energy pop-punk rock hits, but here they use Misguided Ghosts to showcase another effortless side to Hayley Williams’ vocals. Don’t worry, there’s no more awful puns now, it must be the calming effect this song has on us! If you have any other suggestions for spooky songs or terrifying tunes, feel free to share them in the comments section!